At less than a day’s notice, thousands of people turned out to rally and march across the country following Kevin Rudd’s announcement of the disgraceful PNG solution. The protests have been angry and loud and provide a fantastic opportunity to take the fight to Rudd and Abbott. 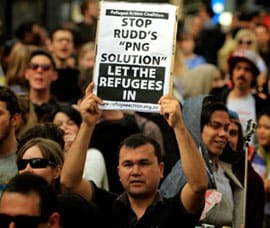 People have continued to take to the streets since then in large numbers to show their disgust with Rudd’s “lurch to the right”. Rudd has trashed political principles for the sake of electoral expediency. Since Rudd became leader, Labor has gone up in the polls, but there is no sign that the PNG solution has made him more popular; in fact the latest poll shows that The Greens have gone up 2 per cent. It is crucial that Labor is challenged on the idea that it needs to be anti-refugee to win the election. Most significantly, there is strong opposition from the unions. Resolutions opposing Rudd’s PNG solution from the unions have already been carried by Victorian Trades Hall Council, Geelong Trades and Labor Council, Victorian NUW, the NSW South Coast Labor Council and the NSW CFMEU Committee of Management. The NSW Teachers Federation has now carried a substantial resolution opposing the plan. The rallies are important demonstrations of public anger and show the scale of the opposition to the PNG Solution. The hundreds of new people at the rallies have been an inspiring show of support for refugees and shows the potential to build a campaign that can win. But we will need more than the rallies to stop Rudd and Abbott and stop the PNG solution. Even bigger demonstrations confronted Howard in 2001 when he used the military to prevent the Tampa bringing asylum seekers to Christmas Island and introduced the Pacific Solution. But Howard won the election in 2001. Hundreds of thousands marched against the invasion of Iraq in 2003, but the campaigned dwindled sharply after that. We can’t afford to let that happen this time. We need to build out of the rallies, draw more people actively into the campaign to keep up the fight between now and the election (which is only a few weeks away) and most importantly, after the election. Regardless of who wins the election, refugees and human rights will lose. We need to fight as hard as we can between now and the election. Big national protests on August 24 can help. A major protest in Marrickville in Sydney marching on Deputy PM Anthony Albanese can take a sharp political message to the door of the Labor leaders that there is serious opposition to bashing refugees. Albanese is vulnerable in Grayndler. Big protests there can convince more people to vote 1 Greens as well as to join the campaign. In every city there are refugee action groups. We need more people in the organising committees. We need to use the outburst of anger to set up refugee action committees in the suburbs, in unions, in workplaces, schools and universities. We need to reinfuse the campaign with the grassroots activism under the Howard government that gave us Actors for Refugees, Teachers for Refugees, We are all boat people, Bennelong, Balmain and Blue Mountains for Refugees. Children, families and long-term detainees were released under the Howard government as a result of the campaign that grew out of the Tampa protests in 2001. It was that grassroots campaign that stopped Howard excising the mainland in 2006. That is the kind of campaign that is needed again. Solidarity is actively involved in the refugee action groups in cities and on campuses. Contact us to get involved in the fight for refugee rights. This meeting condemns the Labor government’s PNG solution and calls for all asylum boat arrivals to be processed and resettled in Australia. Over 90 per cent of boat arrivals are found to be genuine refugees. We call on our state and federal union organisations and the ACTU to oppose the PNG solution and to actively support upcoming refugee rallies.